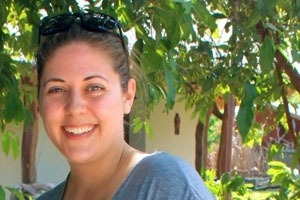 Nicole Condon, MSSM ’15, came to Kogod for impact. She wanted to use her training in science to affect change in business—an ambition she now lives every day. Condon, a former marine biologist and oceanographer, is currently a senior program officer in global seafood markets at the World Wildlife Fund (WWF). She works with businesses on their seafood supply chain, ensuring they’re purchasing responsibly and driving conservation in the marketplace. She believes Kogod helped turn her aspirations into outcomes through its interdisciplinary approach. The sustainability management program blends environmental and social science, public policy and business, offering a multi-faceted curriculum centered on the global environment. “It gave me a tool set I didn’t have before. I can now take my expertise in government, science, and policy, and frame it in a corporate mindset,” Condon says. As she continues her work with WWF, she hopes to find new ways to create meaningful change. She wants to find new approaches that can increase impact—one business at a time. Read more about Nicole and her ambitions below. Kogod School of Business: Tell us some more about your background. Nicole Condon: I went to school for marine biology and got a master’s in oceanography. I consistently saw a disconnect between science and public policy, as well as a public understanding of why this work was being done. I wanted to take a step back and figure out how to make an impact on the “other side of the fence,” which led me to the MSSM program. I eventually got an internship at the World Wildlife Fund (WWF). The role I’ve come into at WWF is really the perfect combination of every degree that I have, which has been fantastic. Now I’m working with major businesses on their seafood supply chain to make sure that not only are they purchasing responsibly, but that they’re leveraging their purchasing power to drive conservation impact on the ground. It’s really driven by the science. KSB: What inspired you to pursue business education in the first place? NC: When I transitioned out of the marine science/oceanography realm, I really dug into the jobs that were available in the market. Every single job that was on the path I wanted required a business degree. Kogod’s sustainability management program was really the only one that took a comprehensive approach to both environmental policy and the private sector. It allowed me to promote sustainability within private companies, which is what I wanted. KSB: Could you talk about your oceanography days? NC: I studied sharks and rays and a lot of topics around their ecology. It was really exciting work, but I kind felt like I was sacrificing fish for the sake of science. I wasn’t really sure what kind of impact it was going to have. That’s why I wanted to shift—I thought I could have a bigger impact in the marine world from outside of science than I could within it. I wanted to raise awareness in the private sector of the impact sustainable seafood has around the world. KSB: In what ways does your background in the sciences complement what you’re doing now? How does it contrast your current work? NC: You know, I actually don’t see any big contrasts. Everything I learned as a scientist directly correlates to the work I’m doing now with businesses. Because I have the understanding and background, it gave me the credibility to have challenging conversations with other scientists, government officials and companies. So now I have a spectrum of people that I can have very detailed conversations with, from varied technical details around fisheries and farms, up to what it means for a global organization. KSB: What led you to the World Wildlife Fund? NC: Our MSSM cohort is really close; we all helped each other get jobs. A friend in my year e-mailed me and said, “Oh, I saw this internship and I think you’d be great for it!” I applied for it, and got it two days later. It’s one of those things where keeping an eye on my network really helped. Since starting as an intern I’ve been promoted once a year. All of my roles have been in the same vein, just increasingly more strategic. It has felt like a natural progression in terms of expanding my role. KSB: What was Kogod’s master of science in sustainability management program like for you? NC: Everyone came from a different background—energy, environmental science, policy—so you had people looking at problems from diverse lenses. This was really exciting, because you got to explore different opportunities while building a unique network. This diversity was true of the professors, as well. There’s no one-size-fits-all approach to this program, which is great. KSB: In what ways did Kogod help you to pursue your passions? NC: It gave me a tool set I didn’t have before. I can now take my expertise in government, science, and policy, and frame it in a corporate mindset. I can create easily digestible information that drives impact around sustainability. KSB: What impact do you hope your work will have? NC: I think most MSSM students are looking to make a global impact—whether it’s in seafood, or climate and energy. For me, it’s really driving conservation on the ground in fisheries and farms around the world, and doing so through the lens of major corporations. KSB: What next career steps do you aspire to? NC: As I move forward, I want to find a unique lens that hasn’t been explored yet. Unique approaches that haven’t been tapped into yet that could increase impact, and scale the work that we’re trying to do. Learn more about Kogod’s master of science in sustainability management program.